Shirley A. Fowler, 81, of New London and formerly a long-time resident of Elyria, passed away Thursday May 24, 2018 at the Cleveland Clinic in Cleveland. She was born September 3, 1936 in Julian, WV. She had resided in New London for the past two years and previously resided in Elyria for over 60 years. Shirley was a golf ball machine operator and worked at Worthington Ball in Elyria for over 30 years. She also baby sat in her home for many years and she became very close to many of the families that she served. She enjoyed golfing, bowling, bow hunting and she was an avid reader. Shirley was very close to her beloved family and she treasured the time that she spent with each of them. She is survived by; three sisters, Frances Mercure (Willard) of Vermilion, Hilda Jones of FL and Velma Neal of British Columbia, Canada; four brothers, Dewey Fowler of FL, Roger Fowler (Patty) of New London, Tom Fowler (Thelma) of GA and Eugene Fowler (Joy) of WV; and by many nieces, nephews, great-nieces and great-nephews. 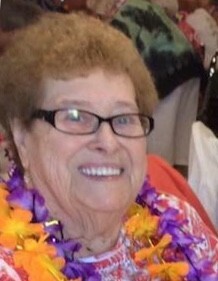 She was preceded in death by; her husband, Bobby Jones in 2016; by her parents, Harvey Ray and Mattie E. (nee Shamblin) Fowler; three sisters, Virginia, Ruth and Imogene; and by five brothers, Harvey, Roy, Clyde, David and Dennis. The family will receive friends on Tuesday May 29, 2018 from 5 to 8pm at the Liston Funeral Home, 36403 Center Ridge Rd., (at Stoney Ridge Rd. ), North Ridgeville. The funeral service will be Wednesday May 30, 2018 at 11am at the funeral home. Pastor Brian Palmer will officiate. Burial will be at Fields Cemetery in North Ridgeville.